If LA is as wet as wet can be and the Hollywood Walk of Fame is starting to resemble a gigantic Slip'N Slide, here's the first thing to do: Start chanting like a three-year-old "Rain, rain go away." Or head for Hollywood Boulevard to join Wonder Woman and Spiderman as you do your impression of Gene Kelly's classic "Singin' in the Rain." If your day is still soppy after that, it's time to find something to do indoors, where it's as dry as dry. Unless you're the Wicked Witch of the West from The Wizard of Oz, a little precipitation isn't likely to be fatal. Don some rain gear or even just a hat and jacket and you'll have more options. Try these ways to outwit the weather. Your mother may have told you to go play outside when you were driving her nuts as a noisy kid, but if you can't play outdoors, go to a place that brings outdoor activities inside. Van's Skateboard Park in Anaheim is the size of a large department store, with an assortment of quarter pipes, banks, handrails, boxes, pyramids and much more to keep your 'boarder busy. If the weather has you climbing the walls figuratively, why not do it for real? Try Rockreation in Santa Monica or Hangar 18 in Long Beach. Rain doesn't have to ground you. You'll find lots of indoor driving and flying fun in Orange County. Take off into the wild blue yonder in a flight simulator. Air Combat USA in Fullerton operates on a limited schedule every month or try Flightdeck Air Combat Center in Anaheim. Or keep your wheels on the ground and race electric versions of old-fashioned go-karts that reach speeds up to 45 miles per hour at K1 Speed Indoor Karting. Going to a garden in the rain might seem a little daft, but some of them have lovely conservatories and other places to get in out of the rain. In Pasadena, you can also explore their library and art galleries at Huntington Gardens. On a sunny day, you may have to endure a traffic jam just to get to the Griffith Observatory because everyone wants to see the city's best views from its parking lot. On a rainy day, the gawkers may go elsewhere, and you’ll still find plenty to entertain yourself with inside. 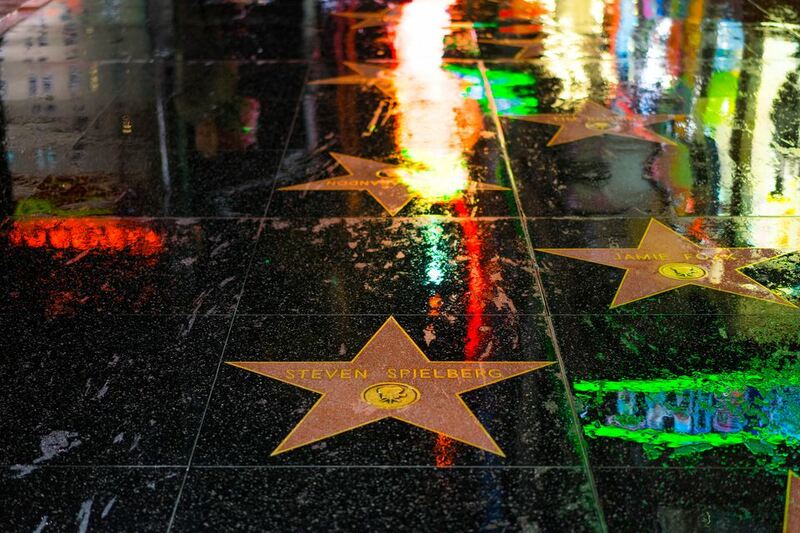 You can also stalk some of LA's most famous film and TV locations (all of them indoors) using this helpful guide to the best film & tv locations for a rainy day in L.A. There's nothing new or unusual about going to the movies on a rainy day, but in Los Angeles, it can be an extraordinary experience. The Cinerama Dome takes movie-going to an entirely new level with ambiance almost as much fun as the film. At the historic Grauman's Chinese, seeing the interior is worth the price of a ticket all by itself. You can also go to a museum. Los Angeles has more than 200 of them to choose from. You know you won't be the only people in town taking that option, don't you? To avoid standing in a long line at the entrance, go to the museum website and order your tickets online before you go. You can also browse the list of indoor day trips from Los Angeles for ideas. Architect Frank Lloyd Wright designed some of his most notable buildings for Los Angeles residents, and the tours are indoors, but if you know Wright, you know that many of his creations had leaky roofs. Don't be surprised to see plastic tarps and buckets. For such an informal place, LA has lots of places to enjoy an afternoon tea, an especially nice thing to do on a rainy day. Try the Rose Tree Cottage or the Huntington Tea Room at Huntington Gardens in Pasadena. For a fancypants hotel tea, head to the Peninsula Hotel in Beverly Hills. Rain + LA = traffic jams that are rightly nicknamed "Carmageddon." The best way to deal with highways on a rainy day is to stay off them. Do what the locals do: Set your maps app to avoid freeways and take the city streets instead. During Pacific storms, the west-facing Los Angeles beaches from Santa Monica to Redondo Beach can get splashed with waves that can be several stories high. It's a fascinating sight to see, but those bad boys can sneak up on you, so it's best to watch from a distance. In general terms, the Los Angeles rainy season runs from November through March. For average temperatures, rain and sunshine, check the Los Angeles weather guide. There's a lot more to do in Los Angeles. Rain or shine. You may also want to take a look at some less well-known LA attractions that are fun to visit. Do you want your kids to have fun in Los Angeles? There are plenty of great places to take them. There are also plenty of ways to make sure you don't blow your budget. If it's summertime when you visit, you'll want to know what to do on a Los Angeles summer night. Or that matter, find out what you can do at night in LA anytime. There are some tourist traps you may want to avoid in LA, but you also don't want to get arrested, surf at the wrong beach, sound like a doofus, or freak out over weird driving.